Aerial of Parcel B in relation to Audi Field. Click to enlarge. Mixed-use plans on the horizon for a parcel adjacent to DC's new soccer stadium are at least a year out, and during that time, the stadium development team has a plan for the vacant plot. 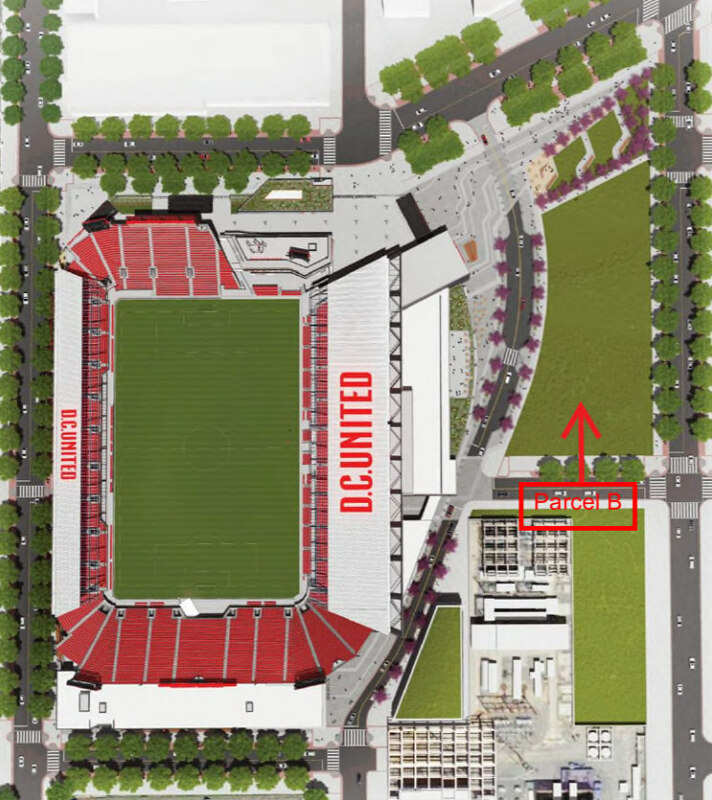 Over two years ago, the Zoning Commission approved the planned-unit development (PUD) that led to construction of Audi Field, the stadium where DC United began playing last summer. One of the areas of relief granted in the PUD approval was that the stadium was forgiven from creating any parking spaces for the project, but would instead show proof of access to 3,750 spaces elsewhere. Now, the stadium development team is returning to the Zoning Commission to seek permission to use an adjacent parcel as a parking lot, at least for the next year. Parcel B conceptual rendering from August 2016. Along with the stadium on its nine-acre Buzzard Point site, the PUD envisioned Parcel B, located northeast of 1st and S Streets SW (map), as a future mixed-use development site. 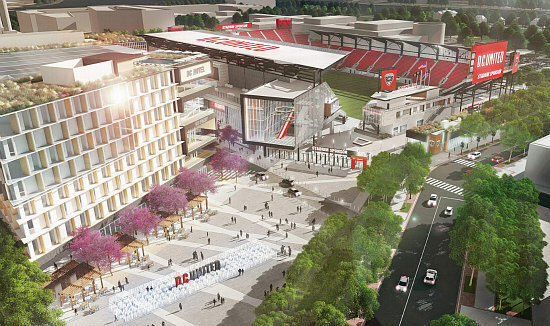 DC United is currently fielding proposals from development teams vying for Parcel B. "Development of Parcel B will likely not begin for more than one year," an application recently filed with the Commission states. "In the meantime, the Applicant would like to provide temporary parking on Parcel B for 125 cars while it remains undeveloped. It would be a gravel parking lot only for people attending events at the stadium and only until development of Parcel B begins, which is anticipated to be in 18-20 months." The filings for the original stadium PUD include a conceptual rendering for Parcel B, which was described as a mixed-use building with hotel, office and event space above ground-floor retail or restaurants. UrbanTurf will continue to monitor proposals for the parcel as they come in. Questions about real estate in DC, VA or MD? Email us. 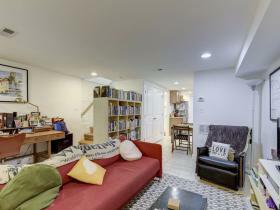 UrbanTurf Listings showcases the DC metro area's best properties available for sale. Ask An Agent: How Much Should I Offer Below the Asking Price? 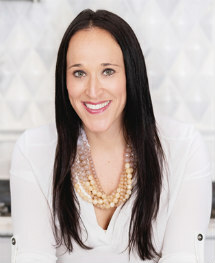 Ask an Agent: What Does "Contingent w/No Kick-Out" Mean? We've collected all our helpful guides for buying, selling and renting in and around Washington, DC in one place. Visit guides.urbanturf.com or start browsing below! Developing An Air of Exclusivity? Glass Half Full or Half Empty? Do You Know Where That Is? DC’s Most Diverse Neighborhood, But For How Long? planning to buy a new home within the next 12 months? planning to sell your home within the next 12 months? a real estate developer or investor?